Impetuous and strong-willed, a 15-year-old planter's daughter commits the unpardonable sin of the mid-19th century: desiring to marry a man beneath her family's social station. When her brother, Dr. Allard Flagg, the acting head of the household, learns of her infatuation with a common lumberman, he immediately sends her off to boarding school in Charleston, South Carolina. It is only a short time before Alice contracts a fatal illness and must return to her home, the Hermitage, in Murrell's Inlet, South Carolina. Upon Alice's return, she lapses into a coma and dies. While her body is being prepared for burial, a ring on a ribbon is discovered around her neck. Clearly, Alice had accepted a ring from the lumberman as a symbol of his love. Not able to accept the reality of this, Alice's brother pulls the ring from her corpse and throws in into the marsh. That much is historical fact. Yet, with her tragic death in 1849, Alice's story does not end. Thought to be buried in the All Saints Episcopal Church cemetery near the Hermitage, Alice reportedly has been seen in the area on numerous occasions in the form of a ghost. Witnesses of the young girl-barefoot and dressed in white-say she wanders around the cemetery and the Hermitage searching for her lost ring. And although she died over 140 years ago, detailed experiences with this despondent ghost have occurred up to the present time. Author Nancy Rhyne takes the reader back to the era preceding the Civil War, when wealthy rice planters wielded enormous power and influence. 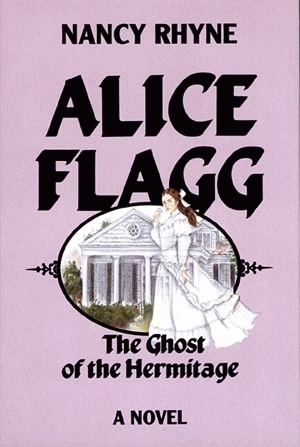 She is an authority on the story of the ghost of the Hermitage, and her work of historical fiction is an exciting story of the life, death, and afterlife of Alice Flagg. Nancy Rhyne is an award-winning author and storyteller. She has written many books, including Once Upon a Time on a Plantation, also published by Pelican. She resides near Wachesaw Plantation, in South Carolina.